"Sports is one thing that holds Jamaica together. 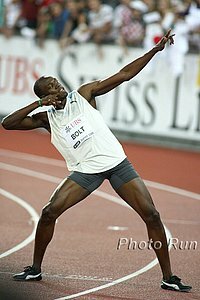 I heard that on the day of Bolt's 100 metres, no one here was killed. Even murder took a holiday for him." - Barbara Blake Hannah of Jamaica, speaking on the day Usain Bolt's plane set down in Jamaica. The entire nation will take off 3 days for partying in October for Jamaica's Olympic heroes, with some parts of the island taking 6 days off. Somebody Help Him Fast Xavier Carter Arrested Again It's his third arrest since turning pro. If you think Tyson Gay, Allyson Felix or Jeremy Wariner had a tough Olympics, think again. Carter didn't even make the team. (We saw one message board thread saying he was got $750,000 a year from Nike to turn pro. They should have given that to Usain Bolt.